NEW! Bahco 5128-JS-H Green Wood Pruning Saw & Holster - 280mm. 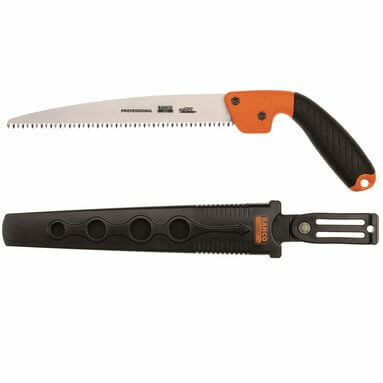 Bahco green wood pruning saw - ideal for landscaping. Sword saw with JS toothing designed especially for pruning living wood. Provides clean finishes thanks to non-set teeth and taper ground blade. Better performance and less friction from the unique concave blade. JS toothing provides extra durability and faster cutting. Safer handling due to integrated knuckle protector. Also available in 240mm: B5124-JS-H.